Art and Life staged an interesting showdown recently in upstate New York. The occasion was August Moon, a three-week festival of performances and workshops sponsored by the Iowa Theater Lab at the Lab’s spacious country home outside the Hudson Valley community of Catskill. To get to the house, you have to turn off of Cauterskill Creek Road and drive up a dirt road; but the driveway is something of a cul-de-sac, and when you get to the top of the hill, all you can do is come down again. After the two days I spent there seeing seven performances and meeting people, I started thinking about the circular driveway as symbolic of the path followed by the artists who appeared at August Moon (the third festival of its kind in four years). Many of them live in New York and trekked to Catskill to concentrate exclusively on their art, while others do their work in the city and went to the festival to luxuriate in a relatively serene setting surrounded by wildlife. Either way, that big, yellow wood-paneled house was an outpost representing the extremes to which serious artists drive themselves: when you’ve gone as far into your art as you can go, you have to go back to your life for replenishment, and vice versa. And since most participants at August Moon do extremely personal work, this tension showed in their performances. Anne Bogart’s piece, developed in workshop and informally titled I’m Starting. I’m Starting Over Again, was a formalistic exercise exploring, she said, “patterns in heterosexual relationships.” It spread out over much of the Lab’s eight-acre estate, beginning in the driveway in front of the house. Four young women appeared – one already in the house, one on foot, one in a taxi, one in a car – and in different ways discarded a male partner. The next scene took place indoors; the women, dressed in garish colors and striking menacing poses, grouped and regrouped for brief, cryptic exchanges in what seemed like a parody of Uncommon Women and Others. For the third scene, the audience was led up the hill to a plateau, where the four women were discovered sitting at café tables at the edge of a field, the unnatural colors of their garments striking a note of decadence against the lush greenery. They began to perform a strange, silent choreography; four men – the boyfriends – appeared from a path behind them and stood ominously half-hidden in the bushes while a tape deck blared the instrumental version of “Give Me Back My Man” by the B-52’s. The women ran off into the woods, and the men took their places at the tables. The audience followed the women into a clearing, where each was performing a separate, isolated scene (one did a Blanche Du Bois speech, one rehearsed a “Happy Birthday” phone call to her father, another put Saran Wrap on her face and applied makeup over that). All around them were small installations – odd combinations of objects formally arranged and all hinting at violence against women. Just when everybody had had time to sense what was going on, the women disappeared and the performance was over. Bogart’s piece was pointed, funny, provocative; it was visually precise and arresting throughout, and the use of space was bold and imaginative. Still, the progression from the first scene’s film-like naturalism to the subliminally dread-filled abstraction of the final scene was, though certainly intriguing, too oblique. The tantalizing dichotomies set up between men and women, nature and artifice, were never resolved, so the piece remained an etude, a fascinating inventory of materials to be used in some more cogent performance. While Bogart’s work was paradoxically outward-directed yet abstract, Tim Miller and John Bernd’s Live Boys was extremely inward-focused yet concrete and easy-to-follow. When Miller and Bernd first performed Live Boys at P. S. 122 last winter, it was essentially a celebration documenting their relationship (in words, slides, movement) with deadpan romanticism and explicit eroticism. But when they performed at August Moon, the relationship had broken up, which brought a riveting, almost unbearable edge to the performance. Tim cut straight to the bone by talking about how he and John were asked, before going to August Moon, whether they wanted “a room with one big bed or a room with two little beds”; a little bit later he announced, “This is our last performance.” (Apparently, the night before a playful boxing sequence had gotten out of hand, and some serious blows were landed.) Already the tension in the room was suffocating, and probably half the audience felt like saying, “Uh, I think I’ll go have a drink while you two guys work this out between yourselves.” But having allowed their lives to intrude so far into their art, Miller and Bernd impressively refrained from mawkish self-indulgence; their emotions, however private, fueled a devastating portrait of failed romance that anyone could relate to. And whereas originally the climax of the piece was a proud gesture (Tim spray-painting letters on their bare chests so that when they stood together their bodies read “faggots”), this performance ended with the two of them ripping and tearing their ceremonial pajama costumes to shreds. It was such a bummer that it was almost shocking to see Miller and Bernd the next day smiling and talking together at the same picnic table; but then they grabbed a shovel and went off into the woods to bury their shredded pajamas. Clearly, these men didn’t just tear up their lives into pieces to serve their art; they also knew how to use the ritual aspects of theater to heal their lives. And the two were unavoidably intertwined. 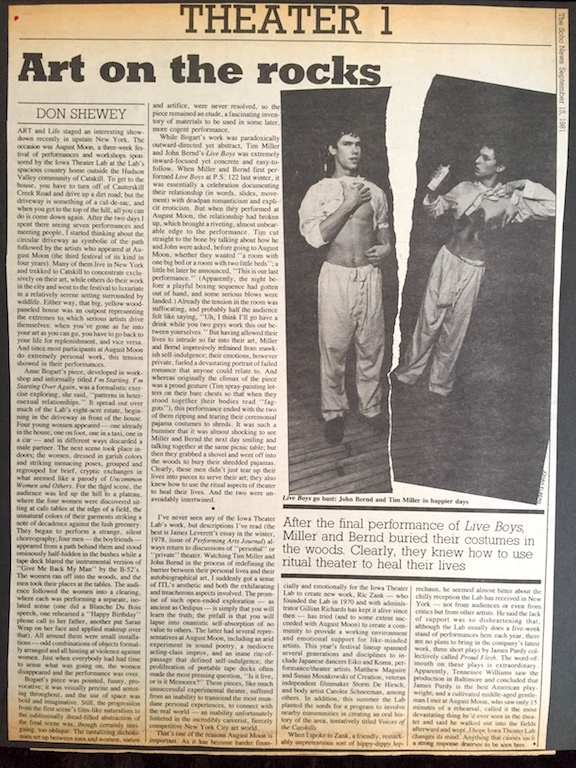 I’ve never seen any of the Iowa Theater Lab’s work, but descriptions I’ve read (the best is James Leverett’s essay in the winter, 1978, issue of Performing Arts Journal) always return to discussions of “personal” or “private” theater. Watching Tim Miller and John Bernd in the process of redefining the barrier between their personal lives and their autobiographical art, I suddenly got a sense of ITL’s aesthetic and both the exhilarating and treacherous aspects involved. The promise of such open-ended exploration – as ancient as Oedipus – is simply that you will learn the truth the pitfall is that you will lapse into onanistic self-absorption of no value to others. The latter had several representatives at August Moon, including an arid experiment in sound poetry, a mediocre acting-class improv, and an inane rite-of-passage that defined self-indulgence; the proliferation of portable tape decks often made the most pressing question, “Is it live or is it Memorex?” These pieces, like much unsuccessful experimental theater, suffered from an inability to transcend the most mundane personal experiences, to connect with the real world – an inability unfortunately fostered in the incredibly careerist, fiercely competitive New York City art world. That’s one of the reasons August Moon is important. As it has become harder financially and emotionally for the Iowa Theater Lab to create new work, Ric Zank – who founded the lab in 1970 and with administrator Gillian Richards has kept it alive since then – has tried (and to some extent succeeded with August Moon) to create a community to provide a working environment and emotional support for like-minded artists. This year’s festival lineup spanned several generations and disciplines to include Japanese dancers Eiko and Koma, performance/theater artists Matthew Maguire and Susan Mosakowski of Creation, veteran independent filmmaker Storm De Hirsch, and body artist Carolee Schneeman, among others. In addition, this summer the Lab planted the seeds for a program to involve nearby communities in creating an oral history of the area, tentatively titled Voices of the Catskills. When I spoke to Zank, a friendly, remarkably unpretentious sort of hippy-dippy leprechaun, he seemed almost bitter about the chilly reception the Lab has received in New York – not from audiences or even from critics but from other artists. He said the lack of support was so disheartening that, although the Lab usually does a five-week stand of performances here each year, there are no plans to bring in the company’s latest work, three short plays by James Purdy collectively called Proud Flesh. The word-of-mouth on these plays is extraordinary. Apparently, Tennessee Williams saw the production in Baltimore and concluded that James Purdy is the best American playwright, and a cultivated middle-aged gentleman I met at August Moon, who saw only 15 minutes of a rehearsal, called it the most devastating thing he’d ever seen in the theater and said he walked out into the fields afterwards and wept. I hope Iowa Theater Lab changes its mind. Anything that causes such a strong response deserves to be seen here.